Over the past few weeks, I’ve been on a hunt for the best Tonkatsu in Singapore, and since Tonkichi Restaurant has always been known as one of the top tonkatsu speciality restaurants, I decided to go there for my first stop. It has been a while since my last visit to Tonkichi, so I was quite excited to try it again. After having the tonkatsu at Tonkichi, I’m thrilled to say that it is still as good as before, and I will go so far as to say that they have one of the best tonkatsu in Singapore. Tonkichi restaurant currently has five outlets at Orchard Central, Isetan Scotts, Ngee Ann City, Tampines, and Suntec City. It has a menu that focuses on sinful but oh-so-good deep-fried food. Most people would probably go for the signature Kurobuta Kata Rosu Set ($32.9), Rosu Katsu Set ($22.9) or Hire Katsu Set ($20.9). For seafood lovers, they have options like the Mixed Seafood Katsu Set ($25.9), and Oyster with Rosu Katsu Set ($26.9). We decided to skip the Kurobuta Pork and go for Hire Katsu, Yakubari (Deep-fried pork fillet, prawn, oysters, and crab croquette) and Cheese Kasane Katsu. Everything was delicious. Deep-fried to a gorgeous golden brown, the Hire katsu was crispy, and not too oily. And what’s there not to like when you have melty cheese oozing out of the pork loin? Hire Katsu Set – Deep fried Pork Fillet. Tonkichi is without a doubt, one of the best Tonkatsu Restaurants in Singapore. I’m going to try Tonkatsu by Ma Maison next, so hopefully I will be able to share with you guys soon. Tell me, where is your favourite tonkatsu in Singapore? tonkichi is very good but i think ma maison is the best! I have been to Tonkichi twice in the few weeks since I have been back from London, simply because it’s too good to miss! It serves the best tonkatsu I know and I think special mention has to be given to the rice, there is the perfect chewiness to the pearly grains. Yum! omg!!! 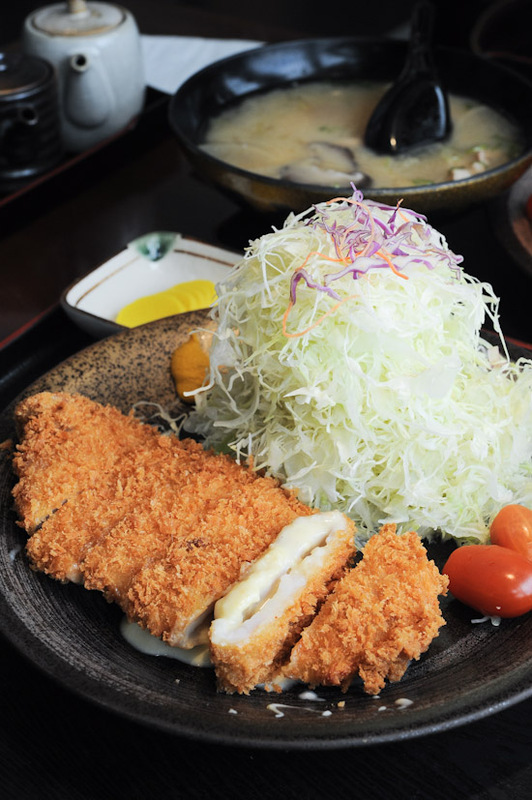 !the picture is so mouth watering, i cant resist but to grab it…..I have tried Japanese Tepanyaki food but i havent tried thes tonkatsu foods. But after going through your blogs I would love to test it. wow these look so good! thanks for sharing! i think you must really try Saboten’s Tonkatsu. They are at Parco Marina Bay, Millenia Walk. I think this is better than Tonkichi and Ma Maison’s tonkatsu.. The meat at saboten is more refined and the serving style more authentic. Generous serving of cabbage, reflective of the famous Tonki in Tokyo with its never ending refill of cabbage. That’s top of my personal list for tonkatsu. you should try the ones from saboten. I used to think tonkichi is awesome until someone introduced saboten to me. Agreed. Saboten comes off as more authenthic and their sauces are really good too! I am Indonesian and everytime I fly to SG then I will make sure that Tonkichi is in my list. My pick is sauce katsu set and what’s better than bottomless japanese steam rice and cabbage! This restaurant is really nice. The food is awesome. Like really awesome tonkatsu, rice, soup and condiments. Although when its peak hours, the service can be slow. The staff are patient and friendly, though.